Feeling SAD? - FirstMed - Your Health Comes First! Have you been feeling particularly dejected, lethargic and all-around fatigued? Do you feel a lack of interest in activities you generally enjoy and instead feel like all you want to do is sleep or eat? 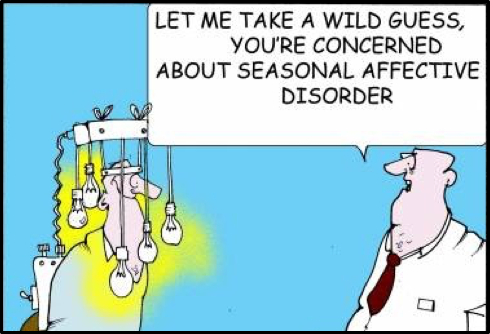 If you recognize these signs in yourself or a friend, you may be dealing with Seasonal Affective Disorder (SAD). SAD is a particular type of depression that is also known as winter depression because it occurs around the same time of year. The symptoms present themselves in the late fall and last throughout the winter months. Winter depression is most predominantly linked to a reduced exposure to sunlight during the autumn and winter months, when daylight hours grow shorter. Though there is no proven explanation, one of the theories holds that light stimulates the hypothalamus, a part of the brain responsible for regulating our appetite, sleep needs and mood – areas that are definitely impacted during winter depression. If you think you or a family member may be suffering from depression, do not take it lightly. Don’t just consider it a case of the “winter blues” or a seasonal difficulty that you need to face by yourself. Be proactive and take steps towards maintaining a positive mood and sufficient motivation despite the time of year. Try some of the tips below to see if following them makes you feel better. Get enough sleep. Though it may be challenging, try to make sure that you neither skimp on sleep nor sleep too much. Throughout the years you have probably figured out how much sleep you need to feel well-rested and energized (within the range of the average adult requirements of 7-9 hours per night), so try to rest as much as is best for you. Exercise more often and participate in activities that make you happy. Though getting out of bed may seem like an incredible feat on a dark, chilly morning, surrounding yourself with people and things you love is well worth it. Take advantage of the daylight hours and spend as much time as you can under the sun. Exercise produces endorphins, sometimes referred to as the “happiness hormone”. Doesn’t that sound like the perfect natural medication? Do not use/abuse alcohol, illicit drugs or prescription drugs that were not prescribed to you. The worst thing you could do for yourself and others around you is substance abuse. This is extremely dangerous and could worsen your depression, increase your suicidal thoughts and be overall destructive to your body and your mind. A reduced exposure to sunlight can also lead to a vitamin D deficiency. This connection is indicative of why vitamin D is also known as the sunshine vitamin, because it is produced by the body in response to sunlight. Though certain foods, such as some kinds of fish, fish liver oils and egg yolks naturally contain vitamin D, consuming these only contributes to 10% of our daily requirements at most. During winter, the daily vitamin D dose for all adults is about 1000-2000 IU/d, a figure nearly impossible to achieve without supplements. Treating a vitamin D deficiency is important to maintain proper bone health and strength, and may also contribute to the wellbeing of other body systems, including the immune, muscular and cardiovascular systems. Studies have shown that low levels of vitamin D are more common in people suffering from depression. Winter depression is an increasingly common disorder, and though the most frequently diagnosed group is women in their twenties, SAD affects men and children alike. This draining and depressing disorder is difficult to deal with, but it can be managed with proper care. If your symptoms persist, be sure to contact a professional. Meet with your family or general practitioner, who will first examine you to rule out other physical or hormonal causes, and may then prescribe antidepressants or further medical or psychiatric consultations. Though SAD is serious, it is manageable with appropriate care, which is why seeking help is vitally important. When was the last time you had your levels checked? Stop by our clinic for a Vitamin D Screening. Individuals with darker skin are at higher risk for Vitamin D deficiency, because the skin’s ability to produce the vitamin in response to sunlight is reduced by elevated levels of the pigment melanin. People who have a greater body mass index (BMI) than 30 kg/m² fall into the category of obesity, and are also at an elevated risk for vitamin D deficiency.